Please contact us for more information or to purchase the items listed in this "Shop" section. 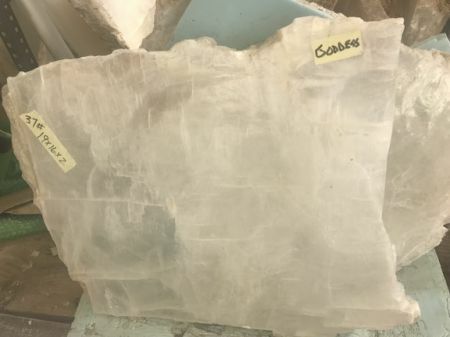 If you are interested in selenite seats, foot pieces, coasters, small clearing slabs, or any other selenite items not in this section, please contact us for current inventory options. 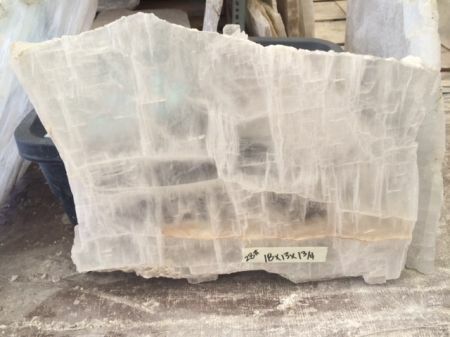 Crystalline Phoenix® has custom cut, milled, and polished selenite slabs of 18" x 12" x 2" ,18" x 15" x 2", 22" x 22" x 2 1/2", and most recently, 38x26x3", for treatment table and table top applications. 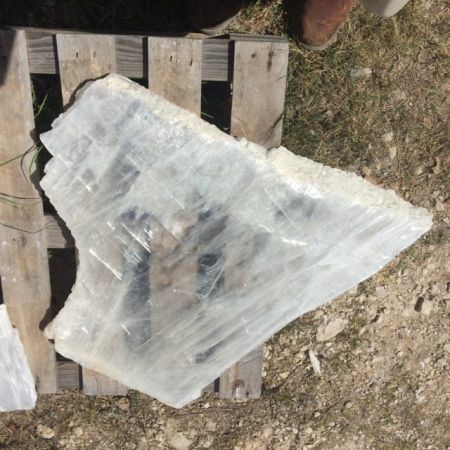 We have slabbed and sold over 100 natural selenite table slabs. 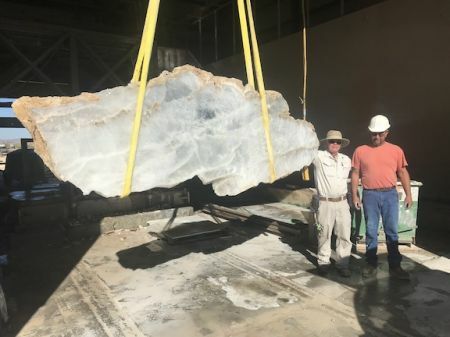 The largest of these were a 880 pound table slab shipped to Florence, Italy and a 900 pound table slab shipped to London. 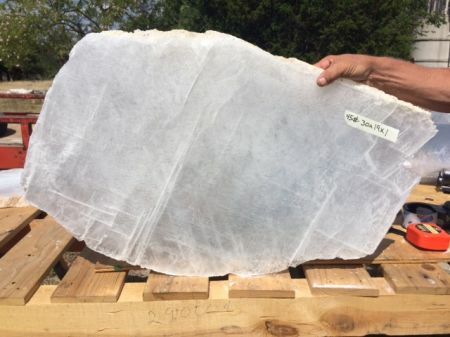 We currently have over 40 table slabs in inventory, including a 114" x 36" x 3" and three 72"x 48"x 3", and we replenish this inventory at least twice a year. We can custom cut, mill flat and/or polish smooth any of these to customer specifications. We can now custom cut table slabs to a variety of shapes, including round and oval. 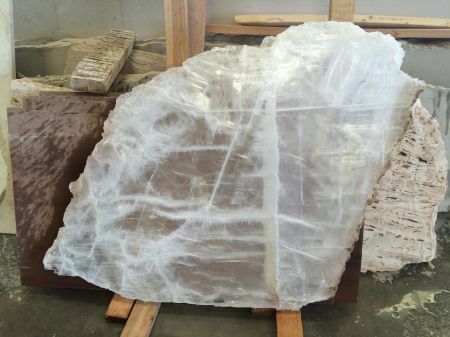 We can also have any of our table slabs placed on a custom native wood base or travertine marble base of your choice. *This inventory changes constantly. Some items below may no longer be available. 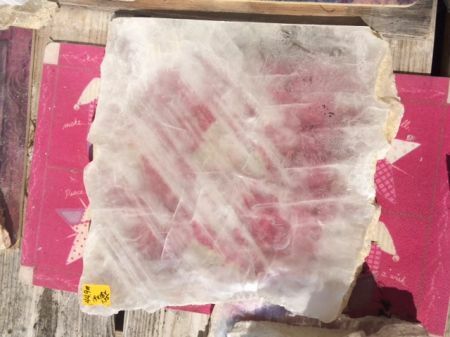 Prices do not include packing and shipping. Last Updated: 11/20/2018. 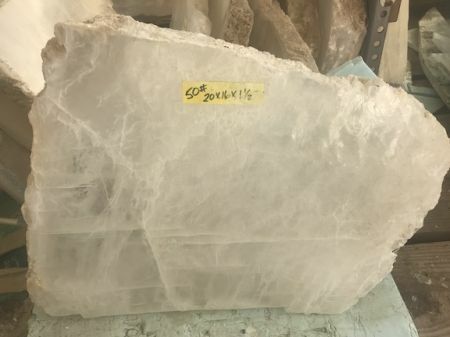 We will be adding new listings to this inventory, and currently have over 50 table slabs in inventory, as well as numerous large raw blocks that we can custom cut table slabs from. In the meantime, contact us with you table requests. 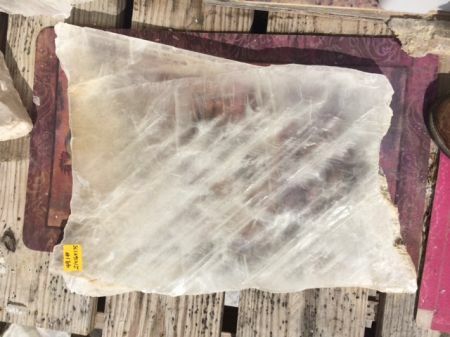 Heart shaped slabs are a special form that selenite sometimes takes. * Dimensions may vary as the dimensions are taken on a non-rectangular slab. Images are for reference only, each piece is distinct and will vary slightly from images. Please contact us for any additional images or details. 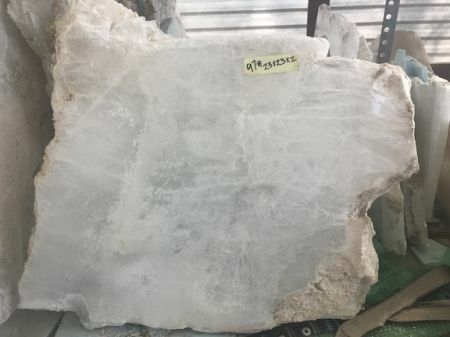 Beautiful, clear heart shaped table slab. 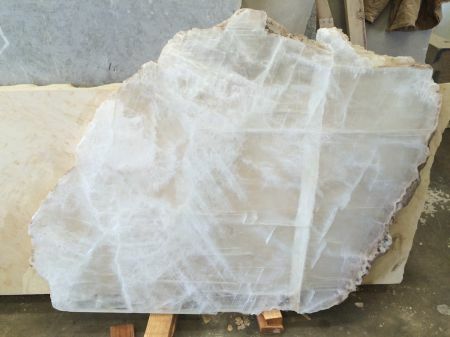 Dimensions: 28" x 29" x 1.25"
Very large dining table size slab. 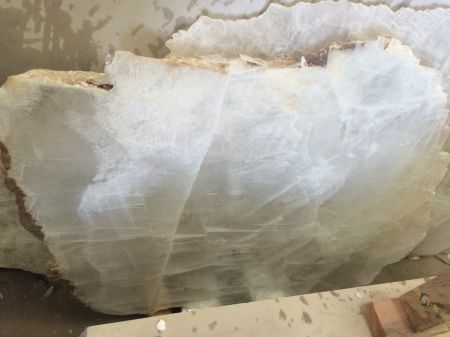 Cut from a multi ton crystal, top and bottom flat, not polished yet. * Dimensions and weight may vary as the weight is estimated and the dimensions are taken on a non-rectangular slab. Images are for reference only, each piece is distinct and will vary slightly from images. Please contact us for any additional images or details. 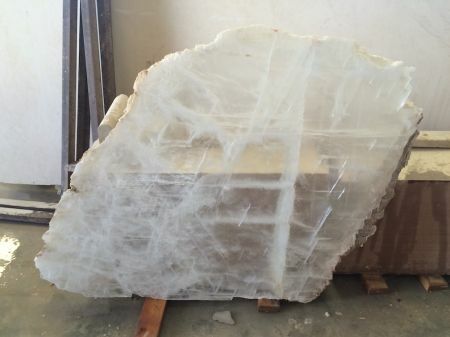 Sister slab to table slab shipped to London, and two other comparable slabs still available..
Dimensions: 76" x 48" x 3"
Dimensions: 114" x 36" x 3"
Table slab that has been cut from larger crystal. 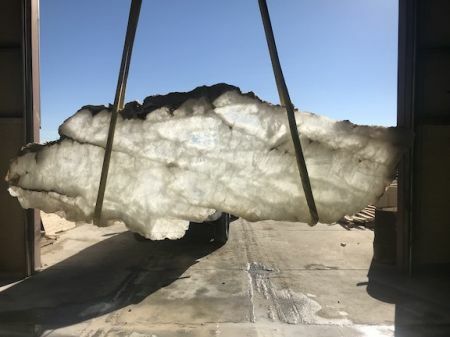 Mostly clear table slab, perfectly flat top and bottom, not polished yet. 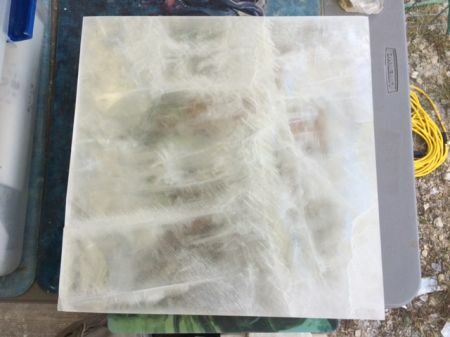 Dimensions: 47" x 42" x 1.75"
Table slab that has been cut from the same larger crystal as the above table top. Dimensions: 40" x 36" x 1.75"
Dimensions: 44" x 40" x 1.75"
Dimensions: 53" x 40" x 1.75"
Side table size table slab. 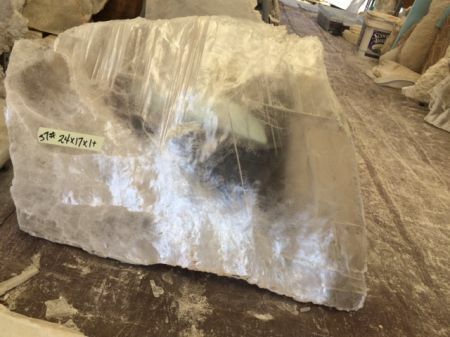 Dimensions: 24" x 17" x 1+"
Part of the roughneck from the 900 pound table slab above. Polished on top and natural rough on bottom. 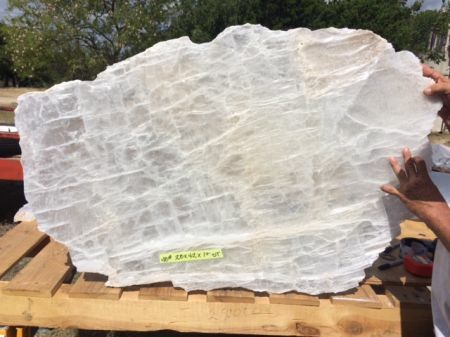 Dimensions: 42" x 28" x1+"
Dimensions: 18" x 13" x 1.75"
Dimensions: 30" x 19" x 1"
Square slabs, polished top and bottom. 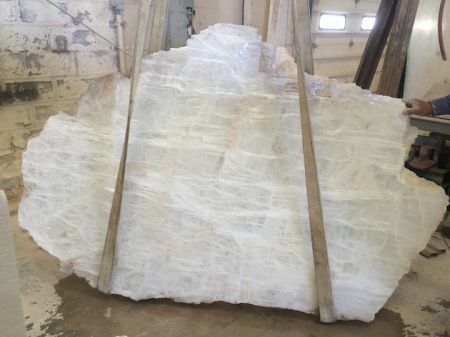 * Slabs will have small imperfections, eg. chips on some edges and corners. Side table or nightstand slabs. Dimensions: 15.5" x 15.5" x 2"
Dimensions: 21" x 16" x 1.75"
Dimensions: 19" x 18" x 1.75"